Chinese Five Spicy Pork Roll.During my university time, there is a small shop providing pork rolls just outside the campus. And my husband is a big fan of this pork rolls.Years pasted and we moved to another city. He is always hinting me that he misses the pork roll outside the campus very much. I ignore his suggestion time and time again and finally I decided to make this at home. And I am super puzzle about the name. I guess pork roll is not most suitable name.There are three important parts of this pork roll—baked pork belly, the tortilla and the dip sauce. Firstly for the backed pork belly; I high recommend using pork belly rather than pork tenderloin since the fat will bring a juicy and tender taste. After marinating for around 2 hours, overnight is best. Roast with 400 degree F for around 30 minutes. Turn over once during the process. After cooling down, cut the pork belly into small cubes and mix with Chinese five spicy powder. During the process, we begin to make the roll wrapper. I use mixed flour with high protein flour and glutinous rice flour. This is a skill learned from the street vendor who is selling excellent Wu Dalang Shaobing (武大郎烧饼). Glutinour rice flour can improve the elasticity of the dough. Here is another skill to make the wrapper super thin. Prepare a plate and brush some oil on the surface. Place the thick wrapper in the center and stretch the thick wrapper into thin wrapper with hand. Heat up oil and deep-fry the thin wrapper for 1 minute. Then we begin to roll the pork up. Firstly mix all the ingredients for dipping sauce and brush the dips on the surface of the wrapper. Lay Chinese five spicy pork with spring onions and chopped coriander. Roll the wrapper up. You can eat directly or cut into small sections and serve with dipping sauce prepared. Super yummy Chinese Five Spicy Pork Roll. Marinade pork belly with the marinade sauce. Do a little message and set aside to marinade for around 2 hours. Preheat the oven to 400 degree F and heat for around 15 minutes. Turn around and roast for another 15 minutes. Transfer out and cool down. Cut the roasted pork belly into small cubes and mix with Chinese five spicy powders. Set aside. Mix high protein flour with 1 tablespoon glutinous rice flour. Pour water slowly into mixed flour. Knead the flour into soft dough and then set aside for around 15 minutes. Mix all the ingredients for dipping sauce well and then set aside. Roll the dough to soft and then into a long log around 2 inch in diameter and cut the log into small sections around 1 inch wide. 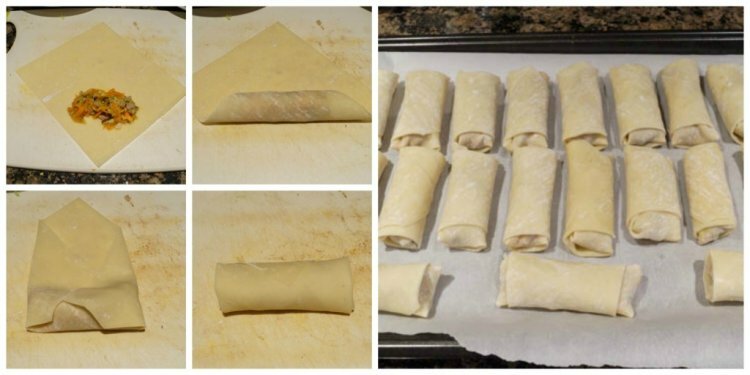 Roll the small sections into a large thin wrapper. Get a large plate, brush some oil on the surface and stretch the wrapper to the shape of the plate. Heat up cooking oil in pan; deep-fry the wrapper quickly for around 1 minute. Brush the dipping sauce on the surface of the wrapper and then lay with roasted pork, spring onions and chopped coriander. And then roll the wrapper up. You can choose to eat directly or cut into small sections and serve in plates. Copyright © 2019 l chinese-cuisine.eu. All rights reserved.